Do you love all things Minecraft? 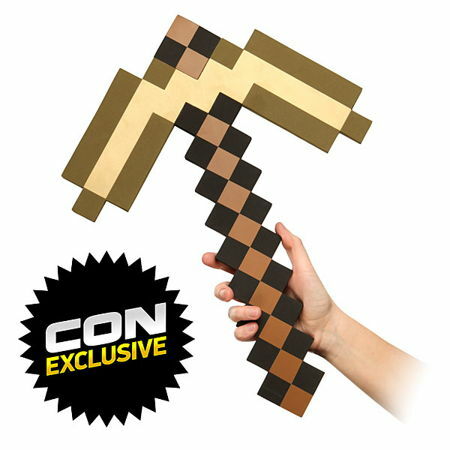 If you have answered in the affirmative, then here we are with this unique convention weekend exclusive, where it arrives in a full size Minecraft Gold Pickaxe. Made out of heavy duty EVA foam, it is good for use for over 33 uses. The $19.99 Minecraft Foam Gold Pickaxe has a data value of 285 to be exact, and it is also an officially licensed Minecraft product so there is no need to worry about it being some sort of fake release. Since it is made out of EVA foam, do not expect to melt it into gold when times are difficult. It might be hefty and yet comes with enough cushion so that you will feel comfortable being able to bash a wide range of materials.